Jury service turned out to be rather boring. I sat and waited, knitted a bit, read some, knitted a bit more, waited... And so on. The knitting endeared me to the catering staff who made me a mug of tea made with a real teabag rather than making me suffer machine tea, while everyone else pretty much gave me wide berth - after all, who knows what a woman wielding 4mm circulars might be capable of? I've been dismissed now, so normality will resume for the next couple of days at least. Looking back over the weekend, Sunday saw me heading to Birmingham to meet up with Heather, Helen and Iszy for a go at dyeing. I'd ordered some Blue Faced Leicester DK and some alpaca 4-ply from Fyberspates to play with, Helen was supplying Kool-Aid and similar beverages and Heather had the acid dyes plus all the expertise. 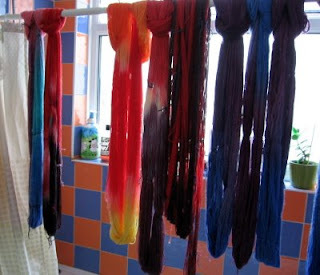 After some discussion, both Helen and I decided to have a go at hand painting one skein and dip dyeing the rest. That meant untying and re-skeining into a really big skein ready for painting, which led to us taking over Heather's garden and turning it into one huge cats cradle as we strung hundreds of meters of yarn up and down its length. 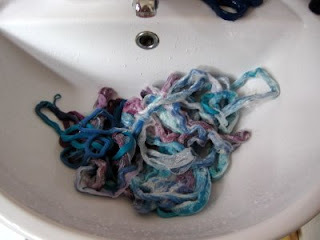 This took some time, but that was OK as my remaining yarn was soaking in water to get it ready for dip dyeing. 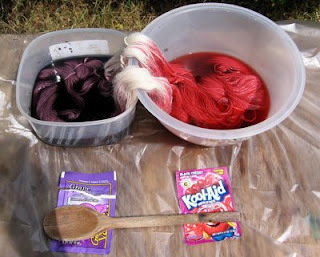 The re-skeined and tied yarn was eventually transferred to a bucket of water as we moved onto having a go at dyeing using Kool-Aid. Here is my attempt in progress. There are actually two packets of each soft drink in the bowls, but I only photographed one packet for illustration purposes. As you can see, this is Kool-Aid Black Cherry and a Kool-Aid-esq soft drink in 'Grape'. No idea what they taste like, but they dyed wool, wood and fingers alike. After this, we picked up the pace a little and were alternating between mixing dyes, dipping wool, squidging wool, wrapping it in clingfilm, cooking it (poor Heather sat in the loft with her dyeing microwave for most of the afternoon) and then rinsing it as we peeled the clingfilm off. We were so busy that I didn't get around to picking up the camera again until we were done. Hand painting yarn was an interesting experience. After watching Helen wrestling her much bulkier skein I arranged my lighter 4-ply onto the table in a sort of giant wiggling zig-zag for painting. 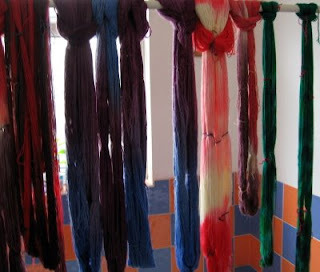 I used the dyes I had left over from dip dyeing plus a batch of turquoise and quite litterally painted the yarn. It was back breaking, time consuming work and I enlisted Iszy's help to get mine done as we were running out of time (and the weather was threatening to turn). Here it is in the sink after cooking as I peeled off the cling film to give it a rinse. Upon reflection, I think I prefer dip dyeing. It was far less precise, but the effects were quickly achieved and very dramatic. Here are our collective efforts hanging up to dry in Heather's bathroom just before we bagged them up to take home. I'll post photo's of my finished skeins once they've dried. I have no time for any creativity at the mo, sob, not even had chance to blog for 2 weeks....roll on Sept!